I've been pondering something many would say is ridiculous. It might seem strange for a blogger to contemplate whether or not she's a writer, but bear with me here. I'm talking about fiction writing for today's purposes, and anyway, I'm reminded of a quote from the movie Contagion: "Blogging is graffiti with punctuation." I believe that was the best part of the movie. I have a rule about people who interview themselves, which is people shouldn't interview themselves because it's annoying. I'm breaking my rule so you can follow a line of logic with me. What do you call someone who drives? What do you call someone who teaches? So what do you call someone who writes? Are we talking published or unpublished? Where's the line between hobby and career? There seems to be a ginormous gray area between physically writing something and reaching publication, and sadly, many writers never emerge from it. If a writer writes and no one reads it, does that mean they're not writers? I've written two novels in the past five months. They're short-ish YA novels with about 80,000 words between the two of them. I've spent hundreds of hours creating plot, dialogue, and revising my pretty little brains out. I've recruited friends, family, and author friends of family to read my first book. I've barely started the submission process. My heart quickened when a publisher asked to see my manuscript, and now I wait again. The reality of the publishing climate says I face scores of rejections and my books will never see the light of day, no matter how good they might be. And yet, I write on. It's become an obsession. A passion, even. So why won't I identify myself as a writer? If someone approached me on the street and asked me what I do, what would I say? Why? Partly because that's my day job, but also because of the potential embarrassment of never getting published. It seems like everyone and their uncle at one point tries to write a book. It's probably on millions of bucket lists. I feel a subtle "That's nice, Dear" from the collective unconscious when I have to explain that yes, I write, but no, there's nothing out with my name on it. Should my books never be published, would it be better to say I was never a writer and pretend they never happened? Pieces of my soul are in these books, and I don't mean that in a Voldemort-y kind of way. I knew what was happening on the page as I typed the words, fully aware of where the plot was going, and I still cried. I was depressed for a day in the middle of my second book because it was so emotionally draining. Pretending they didn't happen isn't an option. So maybe the next time I meet someone and they ask me what I do, I'll have the guts to say, "I'm a teacher and a writer." And to my fellow writers, I suggest we come out of the writing closet and claim our craft. Writing is neither practically nor emotionally easy. Claim it, and be proud of it, even if it isn't published. I close this post with the following comic, because it's oh so very true. Here's to hoping that someday, we'll get to see our writing in a bounded book as illustrated in the fourth panel (but without the accompanying self-doubt). Note: Since I originally published this post back in August, I'm happy to say that my first book is under contract to be published! I was just signing off when I decided to check your So You Call Yourself A Writer blog. I like how you capture the anxiety and fear of identifying oneself as a writer. I was a technical writer for over thirty years and never hesitated to identify myself as a technical writer. Now I'm retired and trying the fiction side of writing but I can't come up with the confidence to tell my friends I'm writing fiction. Instead, it's easier to say I'm just retired. Congratulations on your publication. I'm also published but that hasn't made it any easier for me. My internal dialogue says that if my associates don't bring up my writing successes then I'm just boring them doing it myself. Yes, but when are we authors? I'll start calling myself a writer when I start committing to this thing. Which should be in a week or so when I finally quit my job(I tried to quit a few weeks back but they wont let me go). Amen. There's not much more to say to this...but then, I've made a habit of claiming my craft. When someone asks about it, at least; hollering about it in the middle of rush hour on a crowded street might be a bit much. Kazahari - LOL. Yeah, that would be a bit much. I'm glad you guys liked the post. Good post. Though I won't ever call myself a writer until that's my job. I mean, I play football in my spare time, but I'm not a "footballer". Neither am I a chef, though I cook or a driver, though I drive. A writer writes. An author sold. A novelist quit the day job to write. I am a writer. If anyone asks me what I do...well, at my age, no one asks anymore. I'm very grateful for that, because I know I'm a hobbyist until I sell. I was a hobbyist with stained glass too, but I get to look at what I've done, (and laugh knowing that if I did do that professionally it would have paid me $.10 an hour—a tad bit better pay than selling most novels.) I still sold some stained glass projects. I've sold some of my writing too. I haven't sold a novel. It's not much different than "stained-glass hobbyist" other than the distinct possibility I could, some day, get paid more than $.10 an hour. Famous stained-glass makers get paid a bit more than that too, but now I'm a writer. The BIG question. Are you a (whatever) who writes, or a writer who does (whatever) to pay the bills? My answer is simple. Given the same amount of money, which would you choose to do, write or (wharever)? If you said write, provided you have produced a body of work, published or unpublished, you ARE a writer. Great post! Now what constitutes an artist? Haha, jk. And if I'm not a writer, I'm just an idiot who sits at the computer all day dinking around. So I'm going to go with writer. I like the writer, author, novelist continuum. And what about "what do you want to do?" Is it safe to say I want to be a writer or will I end up disappointing everyone? I work at burger king and currently am studying English literature and fictional writing. I am commited to my story 110% to the point if I don't schedual times for writing ill write all day and night and have severe hand cramps for weeks on end......But I still don't feel like a writer or an author....I feel like its a title that needs to be given. Like you say that you spire to be a writer or a author but until others take off the asperition for you I don't think it will ever be true to ourselves. our whole need is to entertain it doesn't feel right to be able to call myself an author or a writer it should be others who say it to you and that is how it kinda sticks. otherwise arnt we all just kinda recording our trips to our own personal worlds if not to entertain? what is a story without an audience? just a person talking to themselves. I subscribe every word Ohwhoo2 said. You might have the confidence to say "I am a writer", but if you write only for yourself, what's the point? When other people read you because you're giving something to them emotionally, they will call you a writer. Or an author. Or an artist. Then you'll become it. It's a two way connection, so both parts have to feel the same way. Would a teacher still be a teacher if, after studing to become one, he/she will never teach anything to anyone? Writer needs an audience. Singer needs an audience. Producers need consumers. However, that is rather a function of if you are a good writer, or a good salesman. I don't have an audience, because I don't think I've written anything worth publishing yet. Or in other words that I am not ready. And that is a judgment I make on my own words and works. 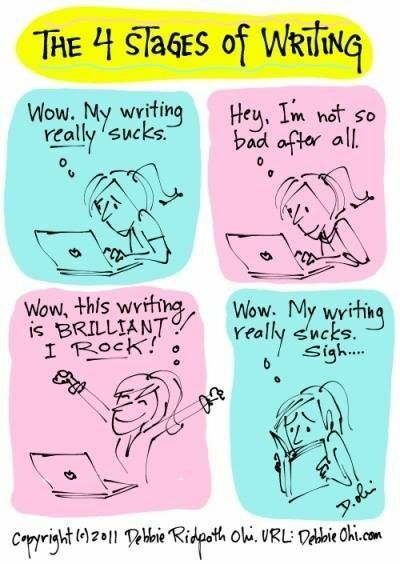 I know I am a writer: just not good enough yet. And I know this without anyone reading what I have written. Why be good? being bad is Fun. Why Be Bad? Being good Feels Better. We should not need other people to validate us. As long as we have produced a body of work, published or not, read by many or only a few, then we are writers. To say that we must be pulished or that we must have a large audience to be a writer is like saying van Gogh could not be an artist. After all, he only sold one painting in his lifetime. We recognise van Gogh as a great artist NOW, but we probably wouldn't have while he was alive. Why? Because he didn't sell? Ok, so he may have recognised himself as an artist, but to gain that recognition from the public you need success. 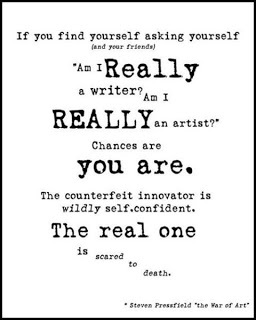 Writers, like artists, are insecure. We only really believe in ourselves when others believe too. I once heard (read?) that many people say they can write a story, but few actually do. In my opinion, If you've written a story, you're a writer. I am a writer. I write and I write everyday. Ask me if I'm published.... well, that's another story. I did have a poem published in a state wide professional magazine. I'm loving these comments. I tell myself that I write as a means to spark conversation. According to my dictionary, one definition of an author is "an originator of a plan or idea." You can be the author of something that is not writing. The author of the peace plan, or the author of his own downfall, for example. a writer is "one who writes, especially as a profession." So a reporter, a novelist, a playwright and the person who writes shopping lists can all claim to be a writer. (Although I don't know many professional shopping list writers.) You can be a writer if all you are doing is putting someone else's words down. Thus, I would say a writer becomes an author when they are also the originator of the idea about which they are writing. Those men sat proudly in church pews on Sunday, their piety displayed along with the jewels around their wives' necks. Then on Monday they would ride forth to evict the sick, the lame and the dying. I am a painter. I couldn't live on my sales, but they add to the income stream I live on. I am a writer. I still get minute royalties trickling in from when I was a professor and wrote academic nonfiction. Now I write novels. No income yet, but I believe this will change. I am not going to call myself a nonprofessional hobbyist based on a belief I'll never make money writing novels. That attitude wouldn't help, to say the least. I admit it's much easier to believe myself a painter and a writer, to call myself a painter and a writer, because I no longer have a day-job identity to confuse myself and others. I paint and write full time. My "day job" is now social security. There's a saying in business, "Dress for the job you want to have, not for the job you have now." By analogy, identify yourself with the occupation you want to continue, writer, not with whatever day job you happen to have now. A mentor once told me a professional writer is not necessarily someone whose main source of income comes from writing. As far as he was concerned, a professional writer might not have made ANY money from writing. Nor might they have even been published yet. 1. They start and FINISH writing projects. 2. They are willing to show those projects to other people (your mum doesn't count.) In other words, you're writing for an audience and not just to satisfy yourself. 3. They are willing to accept constructive criticism. He said you would be amazed how many people have half finished, abandoned projects, the existence of which they would never admit. And he said, you'd be amazed how many people bring forth their work and then cannot take any advice or constructive criticism of it at all. To him, those people might be writers (because they are writing), but they are not professional. Interesting article, although I think you maybe a little too literal. Would someone that plays video games in their spare time answer the 'What do you do?' question with I play computer games? People are too diverse to be categorised in that fashion anyway. Clive Barker is a fantastic writer. He also does poetry, paintings, sculptures, screen plays and has tried his hands at video game design. All of it twisted and debased which opens the doors of your sleep and invites nightmares in I might add. Congrats on your book being published by the way. Congratulations! There's nothing in this world like the feeling of having your first book published, and I know you are excited beyond words or common sense right now. Kudos! With Spaulding and Ohwhoo2, I believe anyone who puts pen to paper is a writer, but an author is someone recognised by others as having created something worth reading. While there is a an enormous difference between the two states, the difference is not necessarily one of quality or value, since a writer can produce something worth reading on the very first try (though this is improbable or impossible for most of us mere mortals). The difference is simply recognition. I'm confident of my status as author since it has been conferred by readers and organisations. Fans and scholars in the Lost (ABC television series, 2004-2010), especially, recognise me as an author. But this fact brings the importance of recognition to the fore. Must a writer receive recognition before being granted author status? How much recognition is required? I find myself attracted to Spaulding's statement that an author has sold. There are no qualifications, and probably there should be none. If a writer has sold even one copy of her writings, she ought to consider herself an author. A favorable review is just icing on the cake and not needed to prove the greater truth that at least one person in this world placed such value on the writer's written thoughts that she was willing to pay for the privilege of reading them. This might seem a low threshold, but I would imagine it seems that way only to those of us who have not tried to write a complete story. To have finished the writing of a novel is in itself a major accomplishment, though anyone who wishes to sell novels knows the first draft is only the beginning of a very long process, and anyone aiming to make a living as a professional writer can tell you that first drafts consume the smallest portion of overall writing energy. It's all in the editing and rewrites. Nevertheless, if you've sold a story it means someone out there thinks of you as the creator of an artistic work. In that person's eyes, you are an author, and I think that fact is sufficient for a claim of authorship. When people ask what I do, I say simply, "I write." If they show any interest at all ("Oh yeah? What do you write about? "), I might inquire about their interests, then use that information to guide me in my response. I might tell them of my television companion books. Depending on their interests, I can tell them about my science fiction, historical fiction, steampunk, or fantasy novels. I suppose I really ought to say, "I tell stories," since my interest is not so much in the writing, but in the engagement of minds and the exchange of ideas. We write. We tell stories. That's what we do. So you call yourself a writer? You bet I do! the first draft is only the beginning of a very long process, and anyone aiming to make a living as a professional writer can tell you that first drafts consume the smallest portion of overall writing energy. It's all in the editing and rewrites. Isn't that the truth?? Somehow I've ended up editing/revising three books at one time. I get to the end of my day and wonder what I have to show for it! It's okay though, because I love it. This is pretty much all I would do if I could get away with it. I really like your idea that we should say we tell stories. We're story tellers. There's an inherent wisdom in that, I think. Great series of posts here. I am a research psychologist by day, and I understand a bit about the struggles that I and many others have to balance the wish with the reality. It seems to me that the label doesn't matter so much as the activity. The original questions focuses on how we present ourselves to the outside world, which to my mind is much less important that what we tell ourselves. My goal is to write a novel, plain and simple. I hope that it gets published, but I have less control over that process. But even if I do get published, then the bar just gets higher: How big are the sales? What is your next book? How can I get better at my writing? First I would like to congratulate you on the publishing contract. Its a big step and a dream for all those who believe they can share stories through the art of writing. While I understand your argument, I beg to differ with you on whether am a writer because I got published or not. If you sing, you are a singer, regardless of whether the best you do is in the showers or before hundre4ds of thousands at the Superbowl. We are writers because we practice the art of writing. When we get published, we become authors. And every writer knows that to get published means to write and write and write, then submit. You could be the next Charles Dickens but we will never know unless you submit your work. I also learnt through the hard way that social media, especially Facebook is a great place to start getting your work noticed. One of the projects I am involved in is a collection of short stories and I got into it through a facebook page. I agree 150% with your post because I feel the same way: the same hesitation to own it, the same fear of saying it & never getting published, everything. I recently went to NYC to a writer's conference & came away with the confidence to announce to the world - I am a Writer. It is my passion. I hope to, someday soon, say that my book is under contract! Congrats on your accomplishment!! Thanks for sharing & giving the rest of us hope that it can happen to us, too. You become expert in your tools, which comes only with hard work and mind-numbing practice so that your hands and fingers and mental computer that works the gears of your writer’s voice require no guidance from you, leaving you free to roam the landscape of the tale that you are spinning. That's your cold qualification as a professional. And then there’s the simple, sincere and personal decision of the artist: I am a writer. Done. It is a necessary decision. And BTW, just because you are a writer does not mean you can’t also be a teacher. You can have a dozen different identities all with equal validity and sincerity. You can be a driver of cars and a rider of bikes and a pilot of planes. You have to abandon all concerns of vanity and self-delusion and perceived milestones by which to measure your sanity (we contrive complex minefields for ourselves because artists are shot at too often and too easily). The bottom line is you have to knock it off, to be blunt. Tough love yourself here. Just approach it like a professional and demand that of yourself. It is a real business and you are the production and you are the manager. Don’t speak about it to anyone if it leaves you vulnerable, don’t brag, but never minimize yourself, especially to yourself. That’s treason. Well said, Artist. I don't necessarily agree with your entire take, but much rings true. I would add "satisfaction" or "pleasure" or, perhaps, "ecstasy" to the mix. Thanks Giglio. I was looking at it more specifically from the viewpoint of what may be required from you, your personal input, to call yourself a writer, rather than the good that you receive from it, the rewards. In fields of the arts we tend to be our own harshest judges when we should be our own best supports and the devil be damned.